MACOMB, IL - - "This Little Light of Mine" appropriately is the underlying theme of Western Illinois University School of Music's Director of Jazz Studies John Cooper's first worship CD, "Baecker Jazz Worship Service," that is now available for purchase at www.baeckermusic.citymax.com. Locally, the CD may also be purchased ($15 each) at the Secret Garden, 2 W. Side Square in downtown Macomb. The old spiritual aptly reflects Cooper's beaming happiness when he talks about the project that received a positive review on Christian Music Central (http://cmcentral.com/news/7316.html). "Most of the music Christian Music Central reviews is contemporary Christian, people like Amy Grant and Aaron Nevil – well-known artists who have a record company that pays for ads and such. I am most honored that they chose to review my recording," Cooper said. "Kevan Breitinger is clearly positive about the writing and the band in her review, and I'm excited to have the project so prominently placed in a global review. Hits to the Baecker order/purchase site tripled after that review. "Recognition of this sort is validating," added Cooper. "I am honored, encouraged, invigorated and excited by the review. This review may lead to others, which may lead to more exposure and sales of the recording." In fact, the CD has received a positive review by Rev. John Buttrick in the United Church of Christ News December 2007/January 2008 issue. "Watch for the release of this CD which had its beginnings in a meeting of the Western/Eastern Association planning committee meeting at the First Congregational UCC, Canton, IL," Buttrick wrote. "A whisper of the Spirit at that meeting has become a big band voice speaking through the United Church of Christ, the talent of Dr. John Cooper and the commission of Garth Baecker." Regardless of what critics may say of this project, "it is a huge achievement," Cooper said. It is also a "huge financial risk," and the fact that they (the critics) "like it is a wonderful bonus, and it will hopefully mean that I may get to do it again if this project succeeds financially," he added. Cooper was commissioned by Western Illinois alumni Garth and Terry Baecker of Pekin (IL) to write a jazz worship service commemorating the golden anniversary of the founding of the United Church of Christ (UCC), featuring the UCC anniversary theme "Let it Shine." He wrote the seven-movement composition that is integrated into the worship service specifically for Western's premier jazz ensemble, the Jazz Studio Orchestra (JSO), which presented the work at the UCC celebration service April 21, 2007 at the First Federated Church of Peoria. 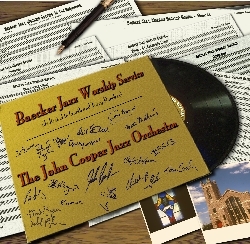 For the CD recording, which was accomplished in eight hours over two days in early October 2007, the jazz musician/composer/director chose "some of the best players in the world" to form the John Cooper Jazz Orchestra. Saxophonists include Kenny Partyka, lead alto; Russ Miller, alto 2; Gunnar Mossblad, tenor 1; Chris Collins, tenor 2; and Mark Berger, baritone sax; trumpeters are: Roger Ingram, lead trumpet; Art Davis, trumpet 2; David Hoffman, trumpet 3; and Brian Coyle, trumpet 4; trombonists are: Rick Simerly, lead; John Mose, trombone 2; Tom Garling, trombone 3; and Mike Pashenee, bass trombone; and the rhythm section includes Matt Michaels on piano; Jeff Halsey on bass; and David Taylor on drums. WIU graduate student Matt Traeger (Williamsville, IL) played trombone 3 on the "Communion" movement. Vocalist is the Rev. DaNita Bell, formerly the music minister of Ward Chapel African Methodist Episcopal Church of Peoria and a featured soloist with the Peoria Heritage Ensemble, who recently moved to Detroit. This orchestra also performed the "Baecker Jazz Worship Service" to a standing ovation congregation at First Congregational Church in Moline (IL) last October. "Some of the musicians, like Matt Michaels, I have known my whole musical life," Cooper said. "He was my teacher during my undergraduate years at Wayne State University and has supervised my growth as a musician through my whole career. Chris Collins, Jeff Halsey, David Taylor all played on my quintet release "Watching for Watchung Plaza," and I have known them just as long." Other musicians on the recording are professionals Cooper worked with when he was on the scene in Detroit as a professional musician. Some others, like John Mose and David Hoffman, are players from the Chicago and Peoria areas who Cooper met since joining the Western Illinois University faculty in 2002. "The relationships I have with the people in this band are deep. They brought with them those feelings of affection for me as well, and it made for a synergistic, productive experience. You can hear it in their performance," Cooper said. "I have lived life with these people, watched their kids grow up, and shared their successes and defeats. We are like a family, and they came to the project with all this positive energy. I think they know how infrequently projects like this happen at the highest level. "To do the whole project in eight hours is a testament to the greatness of their musicianship," Cooper added. "All of these players are at the top of their craft. They are in demand nationally and internationally. Many are directors of jazz studies throughout the country or work as jazz educators like me. If you look at the credentials of the musicians, this is one of the greatest bands in the world. "There were times while conducting that I simply could not believe some of the things I was hearing from soloists. They were awesome, even while sight-reading. It is a memory that I will cherish forever, and one I hope to replicate," he said. Cooper also had some of his Western Illinois jazz studies students in the recording studio to experience a professional recording. "Each day in rehearsals I told them what was expected of professional musicians, and we worked toward that level of performance. For the students to actually get into that environment, to see and hear a band making great music they have never before seen, improvising with passion and conviction in a high-pressure studio situation, was an experience they will not forget," Cooper said. "Most people have to pay $75 to hear Roger Ingram play lead trumpet with Harry Connick Jr. My students got to see me look through a glass divider while a take was in progress, point at Roger Ingram, hold up two fingers, point to the ceiling and curve my hand into a 'C.' Wordlessly, I told Roger to play the next entrance as a double C – an astounding feat for a trumpet player – then hear it as he almost tears the bell off the horn. I was happy to have the students there to see the project taking place," he added. 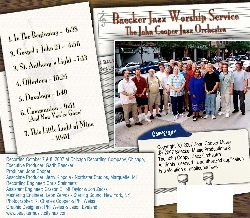 The "Baecker Jazz Workship Service" CD can be ordered online through Baecker Music productions at www.baeckermusic.citymax.com. 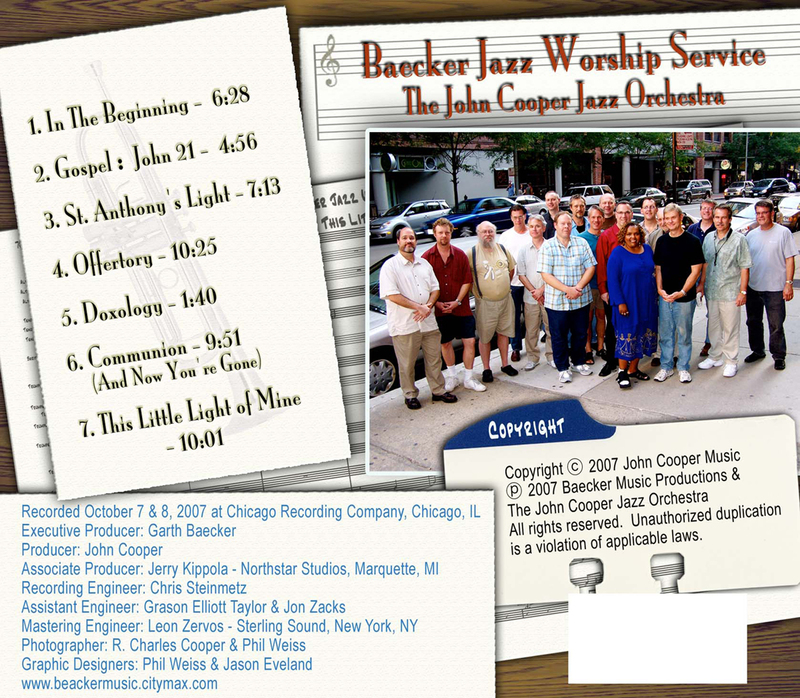 The site includes Cooper's CD liner notes about the composition and the musicians and a link to Cooper's professional website, www.johncoopermusic.citymax.com. Cooper already has commitments from two university bands to perform the work this spring. His Jazz Lab Band at his alma mater, Wayne State University, will perform the composition at "The Max" – the Max M. Fisher Music Center at the Detroit Symphony Orchestra Hall. The University of Toledo also will perform the work in April; date and place TBA.